(April 12, 2018) -- The University of Texas at San Antonio (UTSA) is planning a big party to celebrate San Antonio’s Founder’s Day. 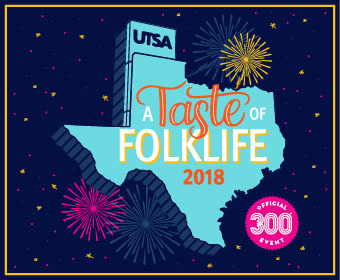 In conjunction with SA300, UTSA is hosting Historic Futures – A Taste of Folklife on Thursday, May 3 at the Student Union Paseo on the UTSA Main Campus. The event is free and open to the public. "UTSA and the City of San Antonio's pasts and futures are inextricably intertwined,” said Dean Hendrix, dean of the UTSA Libraries and co-chair of UTSA’s Tricentennial Task Force. “We are excited and proud to engage with our neighbors and host a celebration of all the diverse cultures that make San Antonio a wonderful place to live." At the Founder’s Day event, guests will get a taste of the UTSA Folklife Festival, which will celebrate its 47th year this June at the UTSA Institute of Texan Cultures. A Taste of Folklife will showcase the diverse and rich heritage of San Antonio through a variety of music, dance and international cuisine. The festivities get started at 5:30 p.m. with a parade through the Paseo featuring musicians and dancers dressed in traditional costumes. Throughout the evening, guests will listen to live music from all walks of life, including country, Latin American, a Scottish bagpipe band and a barbershop chorus. A variety of dancer groups will also perform, demonstrating Mexican folk dance, clogging, African-Brazilian martial arts dance and more. The aroma of food from around the world will also fill the Paseo. Guests will choose from at least a dozen vendors serving Polynesian, Scottish, Turkish, Lebanese and Mexican food. There will also be roasted corn, pulled lamb sliders and Transylvanian Chimney Cakes, and many other delicious eats. A Taste of Folklife wraps up with a colorful fireworks show at 8:30 p.m. Learn more about A Taste of Folklife. Learn more about the Texas Folklife Festival.